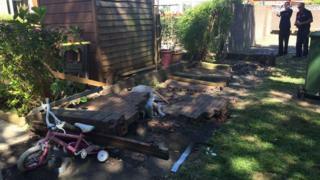 A council has been fined more than £133,000 after a 6ft (1.8m) wall fell, seriously injuring a six-year-old girl. Basildon Council previously accepted fault for the wall collapsing on a housing estate, on 14 August 2016. The girl was airlifted to hospital with life-threatening injuries after the wall collapsed on her in Fleetway, Vange, at Basildon Crown Court heard. The council, which was also ordered to pay £21,419 costs, said it had since taken steps to increase safety. The child, who survived the incident, spent seven days in intensive care with a bleed on her brain, liver and she also had a broken collarbone. The girl now suffers from concentration and hearing problems because of the accident, the court heard. Prosecutors claimed Basildon Council had not inspected the wall for two years before the accident, despite being repeatedly phoned by residents and despite a surveyor saying it was at a moderate risk of falling and was leaning to one side. The council's barrister suggested the wall fell because of attempts to climb it. Sentencing the authority Judge John Lodge said someone could have died in the wall collapse. He said: "As is often the case, it takes an accident for it to be realised that what had been done previously was inadequate." But Judge Lodge added it was clear the council took immediate action to make the wall safe after the accident.